Bibimbap(비빔밥),one of the most popular food in Korea.It is also preferred by many foreigners who are vegetarians(as well as non-vegetarians).A simple but popular dish, bibimbap is a bowl of hot rice served in a bowl topped with a variety of vegetables (cooked and raw) arranged on top. Vegetables can be seasonal, with toraji, bell flower roots, gosari, bracken, bean sprouts, and spinach often served. Other ingredients can include chestnuts, jujubes, ginseng, and a small amount of seafood or meat. An egg may be also served on the top. Most restaurants prepare the dish with a big scoop of gochujang and red pepper paste placed with the vegetables. This dish comes in two ways: a large bowl with rice on the bottom and the other ingredients placed on top, or just the ingredients in the bowl and a separate bowl of rice. Mix all the ingredients together then use your spoon to eat. A bowl of light soup is also served. 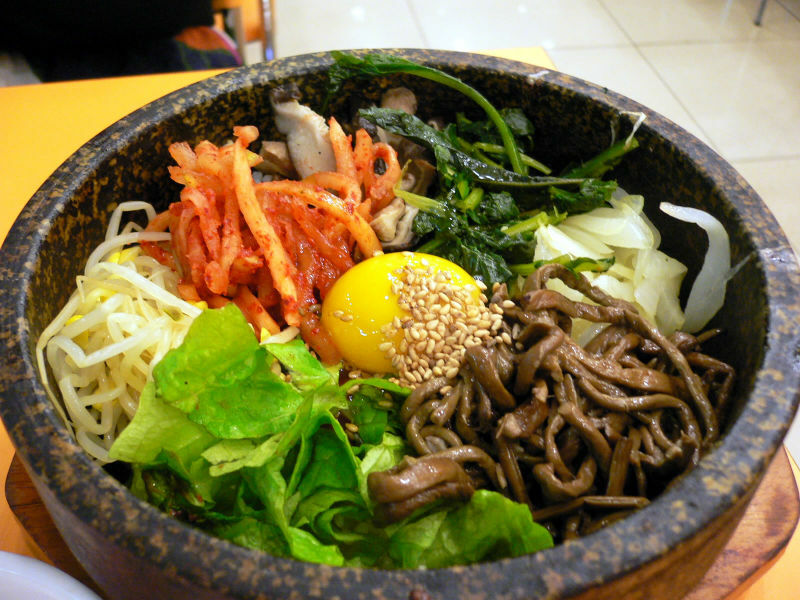 Although the recipe for bibimbap sounds rather simple, there are regional variations and one of the most well-known is the Jeonju bibimbap which contains bean sprouts. With a growing number of health conscious individuals, bibimbap containing fresh shoots, wild greens or mountain herbs are also gaining popularity. It’s not only the variation in ingredients that make a difference. Doldot (stone pot) bibimbap, containing slow-cooked rice, has always been popular. Another interesting variation is the yangpuni (large brass bowl) bibimbap. As the Korean name suggests, the large brass bowl contains enough bibimbap to feed two to three. Vegetable bibimbap is good for health and personally I prefer it,ofcourse with the egg-topping.There are various restaurants which offer varieties of bibimbap and some restaurants are very popular and expensive too.Otherwise it's quite an affordable food.It can also be easily prepared at home.I believe it will suit the people of Manipur with all the fresh vegetables.But the red pepper paste is the real taste maker.Try it! !